Despite that Argentina's Navy has halted the operation to rescue 44 crew members of a sub that has been missing since November 15, experts are still trying to establish the possible location of the vessel. MOSCOW (Sputnik) — The search for the missing Argentine submarine San Juan was complicated by bad weather conditions, Argentine Navy spokesman Enrique Balbi said Sunday at a press conference, adding to that experts are now examining two areas at "a depth of 700 and 950 meters (about 3,100 feet)". The first area was found by the US Atlantis research vessel, but currently it "cannot be examined due to bad weather conditions… [Even though] nothing has been found [so far], we plan to return to this area and scan it with other sensors," the spokesman said, adding that Argentine Islas Malvinas ship with Russia's Pantera Plus submersible on board was sent to this area. The second area was found by Norwegian and Chilean experts, who are searching the site despite the deteriorating weather conditions, according to Balbi. 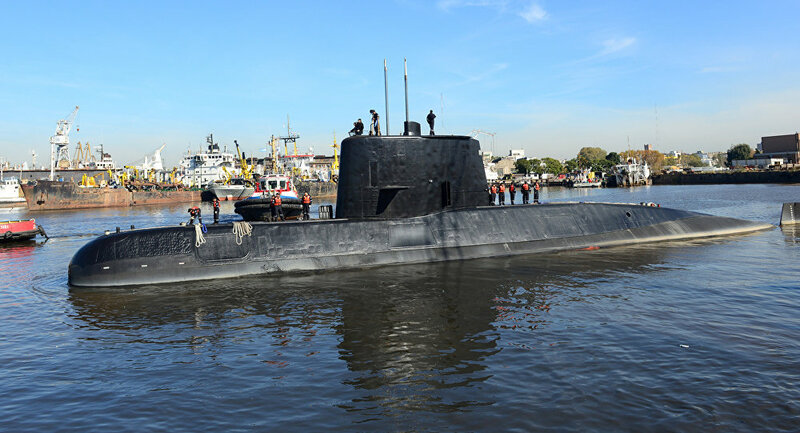 The San Juan submarine fell off the radar en route from the port of Ushuaia to the city of Mar del Plata off Patagonia. According to media, the crew members reported some problems during their last established contact. One of the possible reasons for the sub to have disappeared is reportedly a battery fire caused by a leak, the recent evidence suggested. On Thursday, the Navy announced that it had halted its weeks-long operation to rescue the crew of the missing submarine after the last hope caused by images of unidentified objects spotted on the seabed was dashed as it had been confirmed it was not the lost sub. However, Balbi has previously commented on the end of the operation, saying that the search for the lost submarine would continue to focus on other signals of interest detected in parts of the South Atlantic where the vessel was last heard from. About 28 ships, nine planes and 4,000 people from 18 countries were involved in the search efforts in an ocean area covering 557,000 nautical miles.